It's been more than a few months since the last blog post about I2E - enough time for two versions to be released! In this post, I will highlight one feature from each release, as well as one part of the product that improves with every release. Previously, Smart Queries required a search term in each field: you had to include a Phase (or multiple Phases). In I2E 5.4.1, it is now possible to design the smart query with a field that is allowed to be blank. For example, you may want to make it possible to leave the Phase field blank (that is, allow clinical trials with any Phase) but still search for an Indication (or multiple Indications). This applies to Dates, Authors, Locations, etc. any Smart query item can have its field blank. A great example of this is the collection of Table queries in the Resources query tree: they now allow table headers to contain Any item. Our latest version of I2E includes improvements that make it easier to integrate the tool into your organization and process your internal documents, as well as the usual usability enhancements and under-the-hood modifications. I2E 5.3.1 supports Single Sign-On (SSO) by connecting with Federated Authenticated Systems such as ADFS and Shibboleth. This means that you can be authenticated in one system and then seamlessly log into the I2E client without prompting for your credentials. If you are not already logged in via another system, I2E will initiate the login process via a redirect to a special web page. 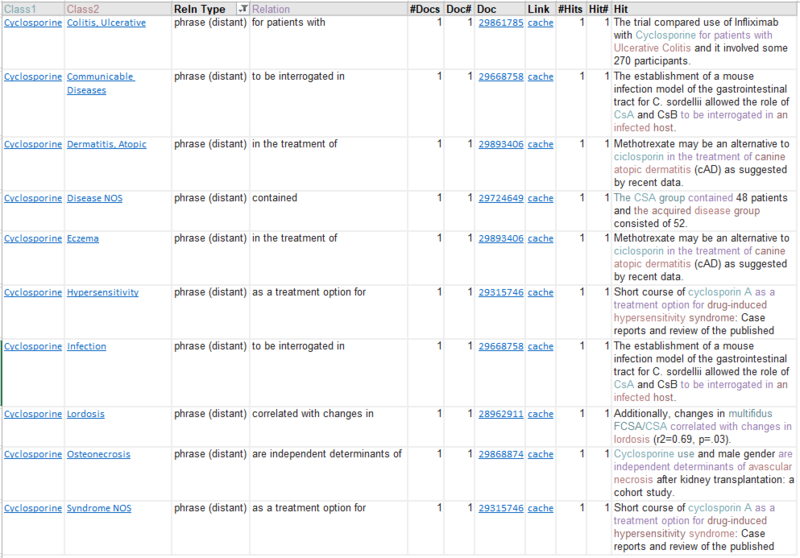 We’ve improved the hit highlighting in our Excel results format (figure 1): terms from your search use the same colors for each column in your results and the colors are consistent across the I2E Query Editor, HTML results and highlighted cache documents. A good example of recent continual improvement in I2E is the Class Chooser. In recent releases, we have increased search speed, added as-you-type class suggestions and, in I2E 5.3.1, we’ve added additional information for each class match to show which Ontology the term is from (figure 2). This helps to quickly review your results to get to your correct match(es), particularly when you’re using a term that could occur in different ontologies. The latest release of Linguamatics AI Natural Language Processing (NLP) text mining software, I2E 5.3, has a number of new features and improvements for creating simple open queries to questions that use advanced linguistic analytics to reveal relevant results faster, with better precision and recall. 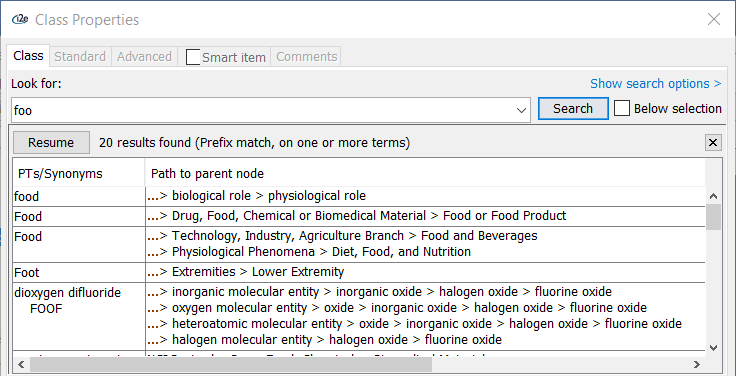 Most of the out-of-the-box I2E 5.3 Resources queries, such as finding all variations of subject-relation-object patterns, or gene-mutation-disease associations, can now be embedded within other queries, allowing you to further constrain your extracted relationships. In I2E 5.3, when you start typing in the class chooser, it will automatically suggest the top 20 classes with that prefix (Figure 1) across all of your terminologies. If you want more suggestions, with our new auto-suggestion feature, you can “Resume” your search to match more terms. Figure 1. Class Chooser Autocomplete for the prefix "foo"
For fresh installations, I2E 5.3 Enterprise is now configured to use SSL (TLS) by default. This ensures that all communication is encrypted and nothing, including user credentials, is sent through the network in the clear. Cambridge, England and Boston, USA — May 23, 2018 — Linguamatics, the leading natural language processing (NLP) text analytics provider, today announced that Bio-IT World has awarded Linguamatics the Best of Show Judges’ Prize for Linguamatics iScite 2.0, a software-as-a-service AI scientific search application that puts the power of text analytics directly into the hands of researchers and clinicians. iScite was one of 46 products considered for this prestigious award at last week’s Bio-IT World Conference & Expo in Boston.